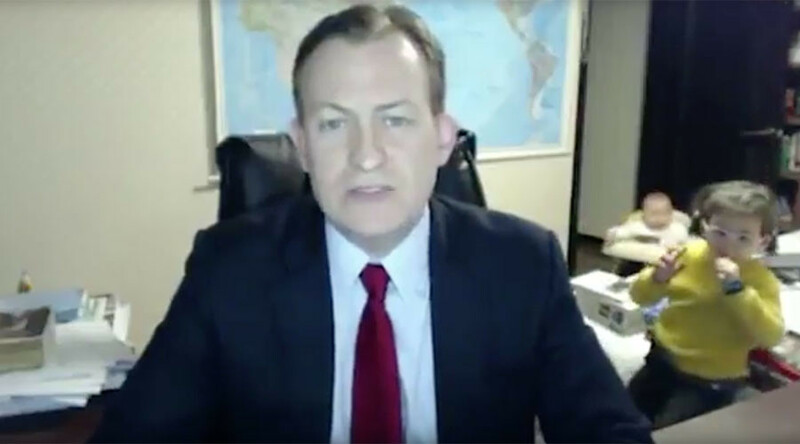 A live BBC interview interrupted by a couple of curious children gatecrashing their dad’s office as he spoke via Skype has gone viral. Robert Kelly, a professor of political science, was delivering his expertise on the South Korean president’s impeachment when his two children burst into his office. The hilarious footage shows the elder child, dressed in a bright yellow jumper and glasses, toddling up behind her father and performing a comical dance behind him. “I think one of your children’s just walked in,” the BBC presenter says. Kelly remains deadpan and continues commenting. He tries to block his child from the camera, but she isn’t discouraged. A younger child, presumably sensing mischief, scoots in through the open door in a baby stroller and bashes into the desk. Then a woman, possibly the children’s mother, frantically rushes into the room, adding to the mayhem. She tries to stay close to the ground, trying but failing to stay out of the camera’s view. She then grabs both children and yanks them out the door. Yells can be heard in the background as Kelly calmly carries on discussing the South Korean situation. The newsreader ends the segment by saying: “Robert, many thanks. There’s a first time for everything.